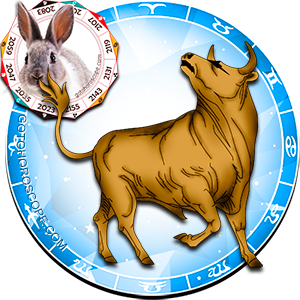 The astrological mix of the Taurus the Bull and the Rabbit from Chinese Astrology is a good one. Western thinking describes a Taurus born personality as one that is steady and composed, but stubborn. So, when the Rabbit's characteristics are introduced to this sun sign, they calm much of the stubbornness and add more reasonableness. This gives the Taurus Rabbit his or her warm, friendly and agreeable persona. A Taurus Rabbit is usually bright and breezy, but also a little shy and cautious. They approach life optimistically and appear to have a very balanced view of it and the people around them. These personalities are some of the most reasonable in the zodiac. The Taurus Rabbit has a real sense of fairness, and everything they do they will be with equality and thought for others. These people are often assumed to be older than they actually are in their youth due to their selflessness and mature attitudes. A Taurus Rabbit is caring, sharing and unbiased in accordance with Western and Chinese astrological theories. These are perfect traits for getting along with others, but could be taken advantage of if not for some the protective Bull influence from Taurus. These individuals are normally fair and unselfish, and their kindness guided by the Taurus in them is usually well-directed. A Taurus Rabbit is keen on helping others, and doing this is often where they are happiest in their working life. They prefer jobs that have a real purpose or provide a valuable service, rather than work in something like manufacturing or retail. The Taurus Rabbit is organized and methodical, and they like some kind of order at work and at home. Orderly arranged things make them feel comfortable, and so these people usually cannot help needing to be naturally neat and tidy. In their living environments they favor plain, functional furnishings that blend in and provide plenty of free, uncluttered space. A Taurus Rabbit's sound judgment and kind, considerate nature help tremendously in their personal relationships. They are generally good judges of character, and will often use their instincts to guide them towards like-minded people. They search for soulmates who will appreciate their openness and return it in equal amounts. A Taurus Rabbit is quite perceptive emotionally, and is able to often anticipate the mood of their partner. They are affectionate, romantic and extremely thoughtful. They may have a little twinge of jealousy occasionally, but good communication with their partner usually prevents it from escalating. The only real weakness in the Taurus Rabbit's personality lies in their proneness to be as unreasonable as they are reasonable. This does not happen very often, but when it does it can be quite unexpected. If a Taurus Rabbit is especially stressed or has had a shock, they are likely to let their weakness loose. They can inadvertently totally switch from their usual cooperative self and become disobliging and stubborn. You will definitely know that they are upset. Fortunately, this weak spot only shows up when they are very emotionally distraught. I am a Scorpio Dog. I want to be friends with a Taurus Rabbit. Hey Richele I'm a Taurus Rabbit and I love to make new friends so find me on Facebook if you want my name is Aaron Metrejean on my Facebook page picture i have long hair and I love to give advice about and on anything. This is definitely me. I meet with many types of people with both rational and irrational actions. I never get a rise out of anyone and treat everybody with level-headedness and good manners. But I am also wary of everyone I encounter. However, just as it says, if someone manages to completely push me over the edge and engages me in violence, I am explosive in my anger and just as unlevel-headed as I am level-headed. Overall, I am a stoic but composed person. Okay I'm a Taurus rabbit and this make better sense. Always looking up fun stuff like this to get insight on what I belong too. Look up just Taurus or just rabbit is helpful but when you put them together like this, makes the most sense. I am a Taurus / Rabbit trying to write a book titled "Layers of my Life". What chance of success do I have? i am live for 28 years as taurus rabbit since 1987.
as far as i knew those statement is True all of them. but. there is maybe losing from it. you must know, this Rabbit and Bull combination mean HARD + SOFT = we are! last one from me. as long as i knew being a taurus rabbit is such a lively person, we can live without other person PERFECTLY ( this also mean there are 2 type of us.. one whom like being in home its mean very closed person this type required patient and honestly to get a relation with us.. the other type outgoing person, this type is not looks exactly outgoing, usually we doing our routine such as working or go to the gym and soon to get relationship with this type.. do not approach directly when they are walking coz we just gonna vanish you out of our mind, therefore try to asking a question that relates where you stand not our personal without asking our name FIRST, yet sometimes we cried when consider we don't have a single friend. that's why Once you have gained the friendship and respect from us a TAURUS no matter what shio is it, there is only one way to lose it, Lie. m tauras everything s true....but me jobless now will i get job?if yes then when m BCA graduate wat job suits me buisness o job??? It's great and true .shy?Just a little. I've been married to this unique combination for over 27 years. This woman is open, honest and one of the most caring and nurturing mothering types to our children I've ever met. Clearly you got it wrong! Shes not a neat freak, but actually just the opposite. Tried the stay at home mom routine for 3 separate time periods. A complete disaster. She won't lift a finger to pick up after herself and becomes passively stubborn and more self indulgent when the behavior is spoken of or when asked to pick up her items that everyone is tripping over. Heck, I even hired multiple outside house cleaners to combat her mess and every service quit because they couldn't keep up with her. She actually became even more untidy and messy. Loves to spend without regard to future needs and will attempt to hide or destroy any evidence of her purchases or spending. A true dust making bunny hoarder. Career wise she is a minimalist. Kept saying she wanted to complete her degree but wouldn't do anything to turn it into reality. I literally had to leave the area with our children to eliminate every possible self defeating excuse she'd use. She did complete her associates degree but refuses to advance any further. It's true Opposites Do Attract. I am a taurus rabbit too, and this sounds very true. ex. I'm not naturally tidy (I hate tidying up), but I do have my own system in everything (with pretty often seems like a mess for others). I am a taurus/rabbit and this iscthe most accurate rescription of me I have ever read! Thank you! Taurus rabbits are well balanced compared to other taurus or rabbits with a different zodiac. I think it's true in western and chinese that taurus rabbits are balanced positive and caring people who have a lot of empathy. My sister and best friend are both taurus rabbits and are the two most honest giving thoughtful and selfless people I know. Not many people will understand their concern. To be very balanced and considerate, may upset some others. This is very very very true. I am a Taurus Rabbit and I have no disagreements on this subject. Every word sounds like a description of me that is 99% perfect!